turmeric « What will I cook today? So we had some nonalcoholic beer in the fridge that I purchased to recreate beer-battered squash flowers and beer-battered avocado fries and so, I used the magic powers of Google to find some uses for it (because just drinking it would be boring). 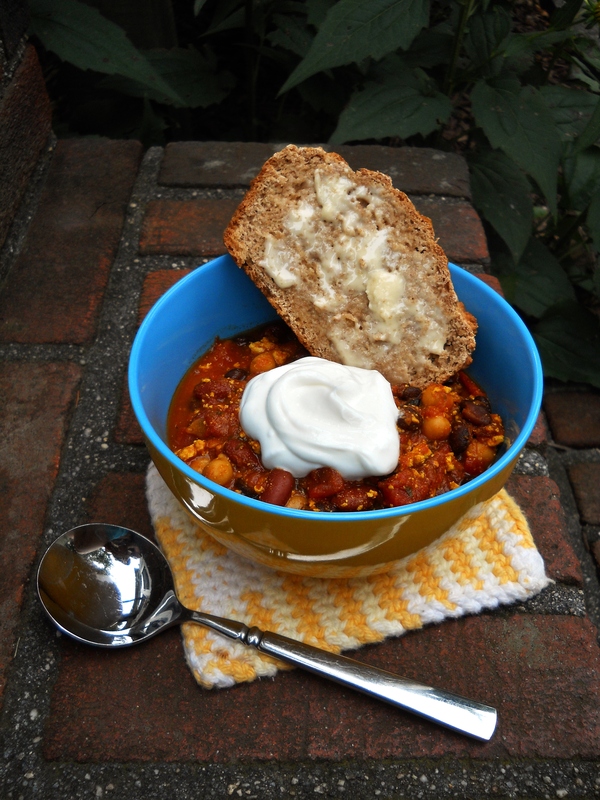 I found two recipes — a beer bread recipe and a vegetarian chili recipe — that fit the bill. And both are easy as could be–essentially, you just throw everything together, let it cook or bake for a while, and sit back and enjoy an episode of Entourage or two on DVD. Simple. Lucky for me, the day I made these was uncharacteristically cold (around 75–it felt like a deep freezer after the >95 week we’d had earlier) and so having the oven and stove running was actually comforting instead of sweat-inducing. 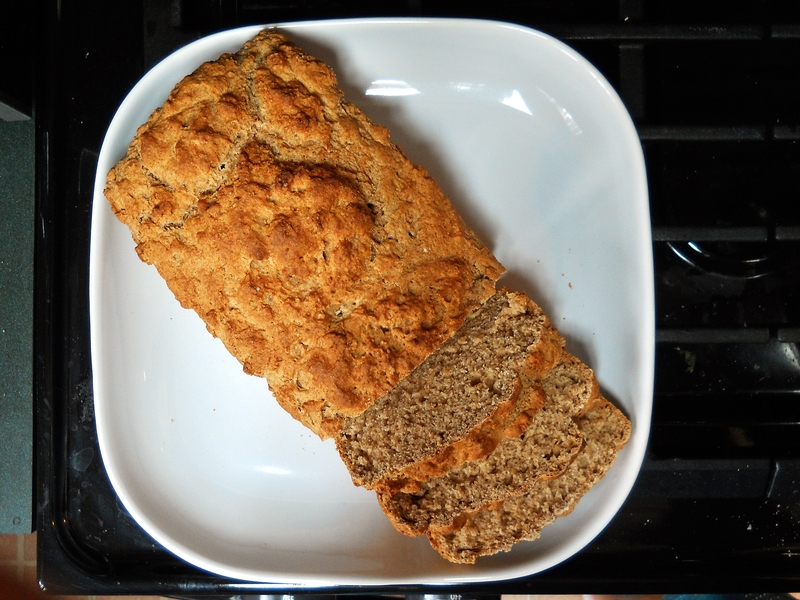 The bread came out delicious–subtly sweet from the brown sugar, with a delicious crust and tender inside. 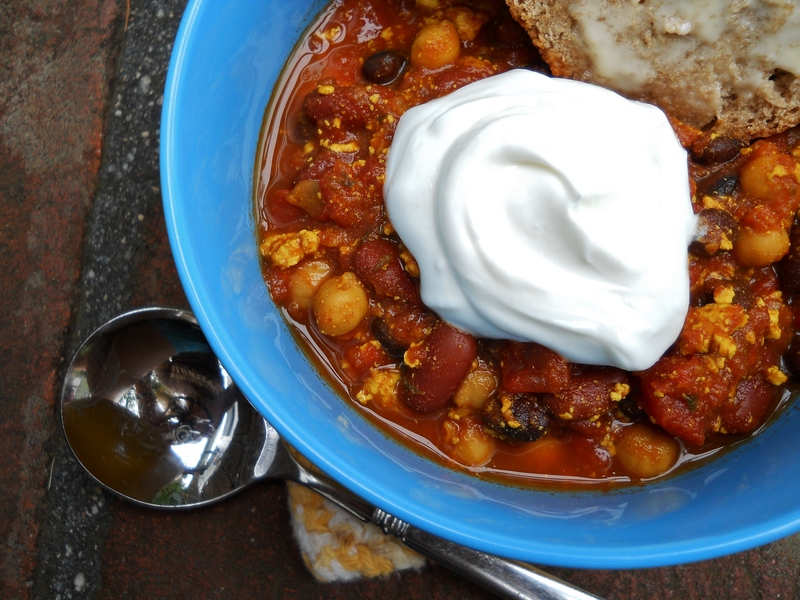 The chili was a bit of an experiment, and I’m happy to report it too hit the spot–three bean, tofu, spice-heavy. Just what the doctor ordered. Chili and homemade bread. Perfecto comfort meal. Oven: 350°F. Grease and flour a 9.5×13″ loaf pan. Sift the flours and combine with sugar, baking soda, and salt. Add in the beer and stir to combine. 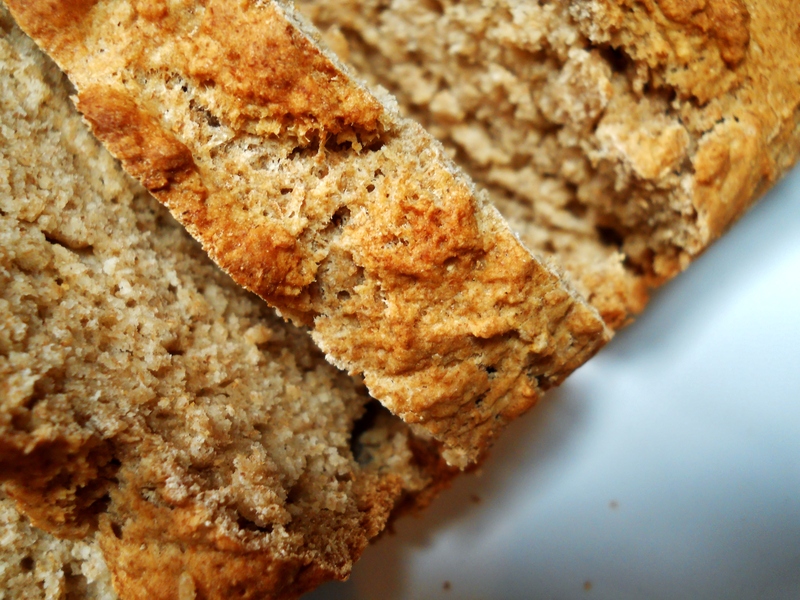 Pour into loaf pan, smooth out, bake 55-60 minutes or until toothpick is clean when inserted and removed from the bread. Optional: before baking, pour 2 tablespoons of melted butter on top. Combine everything but yogurt in large saucepan. Bring to a boil and then simmer for 20-25 minutes. Serve with a dollop of yogurt. This was a really, really good meal. Satisfying. Vegan if you omit the yogurt. See the melty butter (er, earth balance)… mm. It’s melty because that bread is still warm from the oven–what a rare luxury to eat homemade crusty bread. No wonder it’s all gone (within two days). 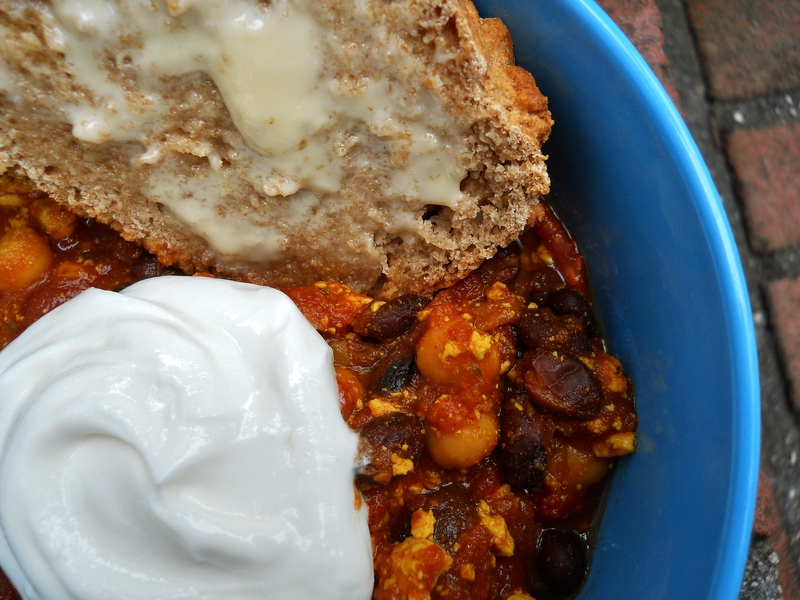 The beer bread goes deliciously with the chili… even if it’s not a cold winter night. Summer has some chilly days too. And the chilly days are perfect… for chili. See what I did there…? 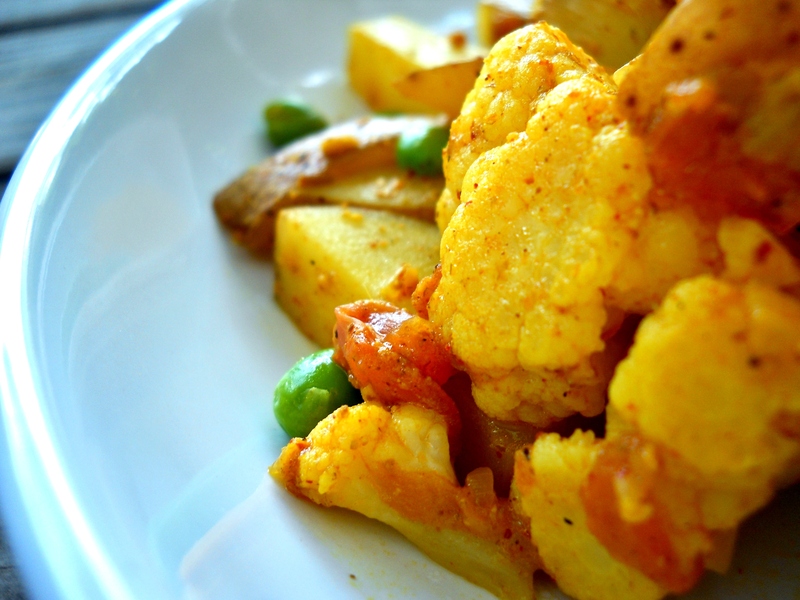 If I could just get myself to an Indian restaurant… I could try something other than Aloo Gobi Mattar. But of course, this would lead to multiple Indian food cravings rather than just one specific dish. I think that’s something I can live with. For the time being, I’ll just keep trying to recreate the only Indian food dish I have tried… and continued to crave. In a sauce pan, add 2 cups of water, 1/2 tsp salt. Bring it to boil. Turn off and add the cauliflower florets, let stand 2 minutes to blanch the cauliflower. Remove. Add cut potatoes to same cooking water, cook until fork-tender. In a wok/kadai, add oil and heat on medium heat. Add cumin seeds and listen for the sizzle. After a minute or two, when you see the seeds turning brown, add cardamom, chopped ginger, and onion. Sauté until onion is translucent, 2-3 minutes. Add the tomato/salt mixture and sauté 3 minutes. Add turmeric, chili, kashmiri chili powder, and continue to sauté. If necessary add 2-4 teaspoons of water to keep it from sticking. Add the ground cumin & ground coriander and sauté. Add a handful of frozen peas. Add two tiny dollops (2 teaspoons) of yogurt, and the pre-cooked potato and cauliflower. Mix well–be sure to get all of the sautéed bits from the bottom of the pan to cover the cauliflower and potatoes. Add garam masala, mix, and close the lid on the wok and let it simmer (There wasn’t much to simmer for mine, so it just kind of cooked a little longer) to marry the flavors. Stir to avoid stickage, unless using a non-stick wok (like I did). If there is any liquid, open the lid and let it evaporate. Let cool but serve hot, topped with fenugreek leaves (didn’t have). A note about the formatting of the ingredients: These ingredients can be combined beforehand in small bowls to make use of mise-en-place, which you’ll find quite useful in this recipe because of the multitude of spices. So ingredients that are bolded in a row can be in one bowl; underlined => different bowl; italicized => different bowl. Little glass bowls are perfect for this. I am usually too lazy to do mise-en-place, but it’s a definite for this recipe. So this was quite yummy! Having non-burnt garam masala made a difference I think, as did fresher ginger and such. But while my first attempt at this dish came out too brothy, this one was hardly brothy at all–in fact, it was rather dry. I was hoping for more of a thick stew sort of thing, that could drench rice; a sauce that could be cleaned off the plate with some naan. Still doesn’t live up to the one I had but it was fun to make, and better than my first attempt. It was deliciously spicy (in the flavor way, not in the heat heat heat way). I like that this dish is mainly vegetables but is still so filling. I’m glad this one included tomatoes to add more umami/savory flavor. I added peas for a pop of color (was not in the original) and some sweetness to go with all of the savory spices.